The Parish of Seacroft serves the communities of Seacroft, Swarcliffe and Whinmoor. We are one Church organisationally, with three places of worship: St James’ Church, St Paul’s Church and St Richard’s Church. More can be discovered about the Parish and each church in the History of the Parish section below by clicking on the link. There are six congregations: three meet on a Sunday morning in each Church, 9.30am at St James’, 10.00am at St Richard’s and 11.00am at St Paul’s; there is a simple service of Prayer and Reflection at 10.30am on Tuesday mornings at St Richard’s; Little Angels for Under 5’s and their carers meets during term-time every Wednesday at 1.00pm at St James’; and ‘Praise, Prayer, Fellowship and Refreshment’ meets every Thursday at 2.00pm at Woodview Sheltered Housing Complex in Swarcliffe. Children and young people are always welcome at any of our services, children’s groups are available during Sunday morning worship and Little Angels is aimed especially at under 5’s. 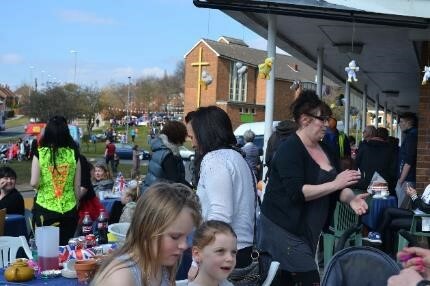 We are committed to serving our community in a variety of ways by working alongside others; Olive Branch Community Café and East Leeds Foodbank outlet, Community galas and fun days, Christmas toy distribution, community children’s and youth work, community leadership and development, Neighbourhood Planning, linking with local schools and much more. Baptisms are available at all our churches and St James’ and St Richard’s are also available for weddings and funerals. We also have venues available for hire with kitchen facilities for parties, meetings etc. and all our churches have disabled access. Find out more about the Church of England, the Diocese of Leeds (which was previously called the Diocese of West Yorkshire and the Dales), and The Inclusive Church by clicking on the following links.